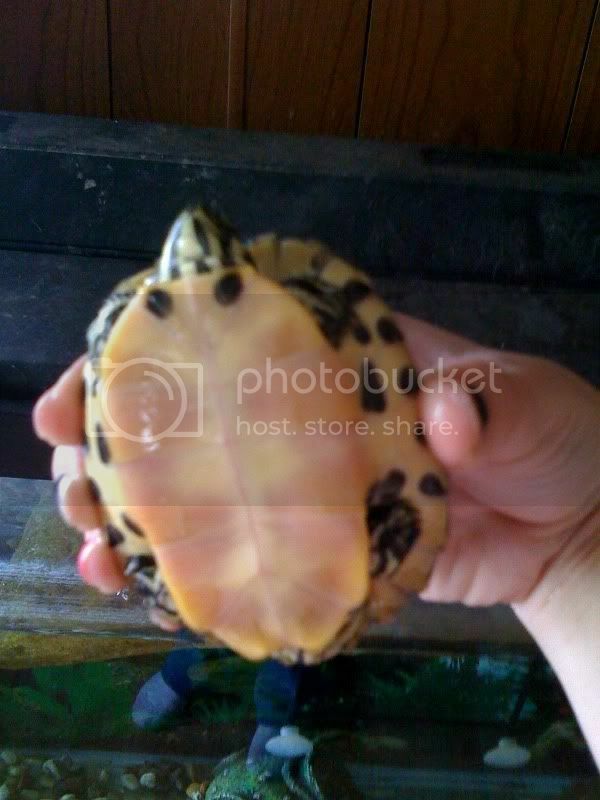 Paw Talk - Pet Forums > Other Pets > Reptile & Amphibian Discussion > What kind of turtle is this little fella? So, my aunt found out that my turtle passed away recently, and she offered me her daughters turtle that she don't take care of. I didn't really want another turtle, but I took it anyways because they don't take care of him. He lived in a 5 gallon tank, with fishtank rocks, small dock, no lights, or anything..and when i picked him up today his tank was all green and gross. He don't know how to swim either. Looks like a yellow eared slider but better pictures of his head would be helpful. he wont stick his head out. but like hecant swim at all! so idk what do do with him untill he can swim. i put him in the tank and he frantically tried to swim to the top but couldnt. they told me he was a yellow belly slider. If he can't swim, somthing is very wrong with him! You need to talk to a vet, or get another turtle from the petshop. Poor turtle. Good luck with him. I'm sure he'll get it down soon enough! I am sure he will learn once he actually has enough room. Maybe if he could see your other turtles (put his tank close to theirs) he'll figure it out. I don't have any other turtles. 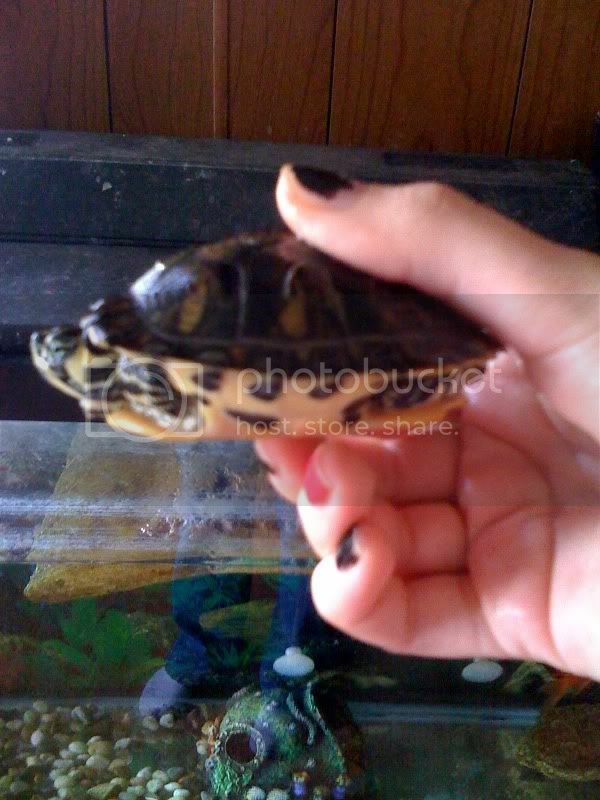 my turtle, Tornado just passed away like last week I think. and I didn't want another turtle after that, but my aunt told me to take hers, and i couldnt just leave it in a little tank so i was ncie and took it. Yellow bellied sounds probably right. My turtle breed knowledge has been flushed it seems...Anyway, he's a cutie. About him not being able to swim, when I got Stumpy off someone who 'cared' for him the same way that your guy has been : (tiny tank, no water, dirty water, nothing to climb on, etc..) I had to basically 'teach' him how to. Now, if in water your turt is literally struggling-VET. If he has basic foot mobility down, he's able to kick his feet but just dont know how to swim then try this... It worked for Stumpy: Fill the tank to a few inches higher than his standing height and just make sure he has plenty of things to grasp in order to get air. I used like 3-4 of those plastic ladders people give to birds and small rodents. Plus I lined one side with plastic plants that he learned to stand on. Once he gets the hang of that, put live fish or bait in and he has to chase them to eat. If he prefers food that wont move like tasty lettuce or something then move it around the tank to get him moving for it. Then keep increasing the water height probbly over the course of a couple weeks. He should have it by then... If not then as a result of his previous lifestyle he may need to see a vet... Either way, GOOD LUCK and keep us posted! !